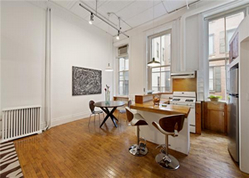 Soho Live Work Loft | Broadway - Call / 3000 SF. New to market today, approx. 3,000 SF. 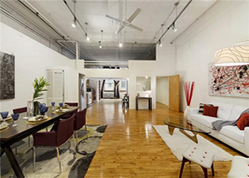 of duplex Live Work Loft Space on Broadway itself, south of Houston. 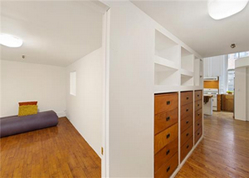 This top quality space is move-in ready and able to accommodate a range of professional needs. The loft has been updated and built-out to the highest of standards, ensuring recoupable value and appreciating yielding gains. Tall rising thirteen and a half foot exposed beamed ceilings with attractive lighting loom over original maple beam floors. At the entrance the space has been outfit with a galley kitchen that leads to an open space that can be configured into a bull pen or collaborative team space. A spacious mezzanine allows room for relaxing and sleeping. The kitchen has been appointed recently with quality appliances; most notably both an LG refrigerator & LG vented washer / dryer. Furthermore the loft contains two private windowed offices with enough space for your desk, chair, filing cabinet and seating for guests; giving you the space needed for confidential discussions and the tackle work that requires a lot of concentrate. Any and all of which is supplemented by high powered air conditioning and ample storage. By the rear courtyard vantage – the loft provides a sanctum from the hustle and bustle of city life. At this portion of the unit – the windows face westward offering great sunlit afternoon exposures. In the mezzanine mentioned above stands an addition private windowed office. Storage is available throughout the loft in the form of custom wood cabinetry, an expansive walk-in closet, and by the room offered in the mezzanine, giving you abundant options by clever design. For those of a truly artistic bent, the loft herein also contains an additional storage room with matching thirteen and a half foot high ceilings plus with the inclusion of another mezzanine within this portion of the space – a great place for your works in whatever form they may take! The property itself as a whole was originally built in 1884 and served as a store and storage facility for the estate of D.H. Haight; occupying the space that once played host to the most lavish hotel in the world. Previously the Saint Nicholas Hotel resided at the site circa 1853, created at that bygone era when this area of the city was a trendy theatre and shopping quarter. That renowned property once could accommodate up to 1,000 guests, with accents and features such as the marble-fronted entry – this building was the first of its kind coasting $1 million in construction, helping to cement a new customary class of distinction – overshadowing the Astor House as the chief hotel in New York. - Local Subway Access; N/R at Prince Street (0.1 miles), 6 at Spring Street (0.2 miles), B, D, F, M at Broadway-Lafayette (0.2. miles), J, N, Q, R, Z, 6 at Canal Street (0.3 miles), the C & E at Spring Street (0.3 miles), the A, C, and E at Canal (0.3. miles), and the 1 Train at Canal (0.3. miles).